One final warm and steamy day awaits us today as the frontal boundary that is going to bring us a taste of Fall pushes on through Pennsylvania through the course of the day. Ahead of the front, warmth, humidity, and varying levels of sunshine will reside through the region over the course of the day. 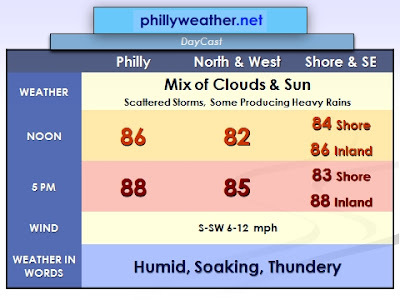 Temperatures may flirt with 90 in the immediate Delaware Valley and points south but we're projecting upper 80's for daytime highs this afternoon. Temperatures should not be as warm as yesterday as the core of warmest temperatures aloft will be northeast of the region, which combined with gradually increasing clouds will result in a "less hot" day. It will still feel pretty miserable out, no matter how you slice it. Thunderstorms, as depicted on the NAM up above, are projected to move towards the Philadelphia metro towards midday and into the afternoon hours. A couple of scattered lines of storms may be in the offing through the course of the day, with activity to our west and northwest producing localized downpours and also gusty winds. A slight risk of severe weather is out for portions of the region...we'll have more on that later this morning!